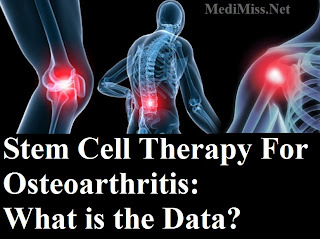 MediMiss Arthritis arthritis holistic medicine Arthritis Relief Arthritis Symptoms arthritis treatment Knee Arthritis knee pain osteoarthritis Stem Cells Surgery treatment Stem Cell Therapy For Osteoarthritis: What is the Data? 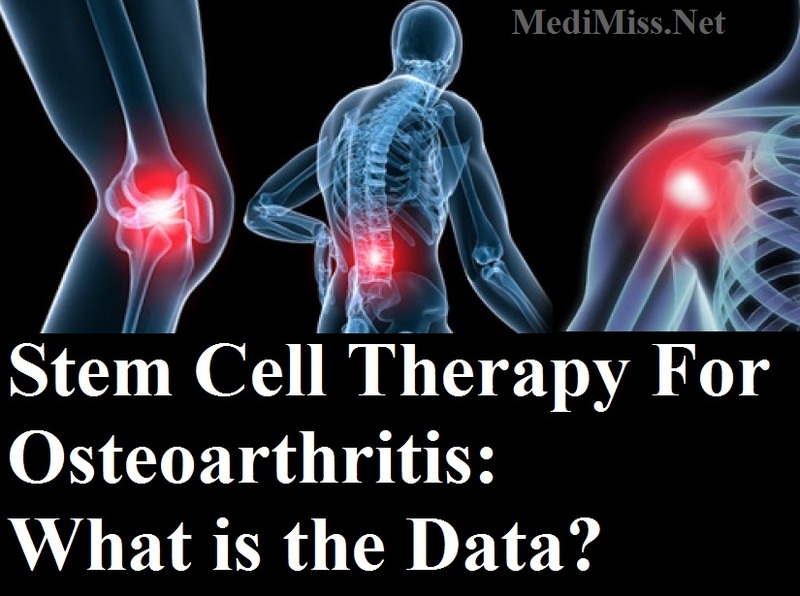 Stem Cell Therapy For Osteoarthritis: What is the Data? In the last few years, a number of methods have been developed to repair cartilage damage. These include osteochondral transplantation, microfracture surgery and autologous chondrocyte (cartilage cell) implantation. A feature common to all of these techniques is that they are limited to the repair of focal lesions. Patients with OA are excluded from treatment. OA cartilage lesions are usually larger and unconfined and so do not provide an appropriate environment for chondrocytes to be retained long enough to build a framework (matrix). So...successful repair of OA cartilage damage is dependent on the ability to form a matrix within the joint. Effective cartilage engineering protocols have already been developed in which chondrocytes in young animal models have been shown to be effective in creating cartilage. Generating cartilage using adult human cartilage cells is far more challenging. Older OA patients have cartilage that is less responsive to stem cell stimulation and their stem cells seem to respond less well to the usual growth factors. There are three potential avenues for obtaining stem cells. The first are embryonic stem cells which have the attraction of being relatively pristine. However, political and ethical interests have made this source of stem cells unobtainable. Plus, there is the theoretical possibility that theses stem cells may grow unchecked leading to unregulated growth, ie cancer. A second source are mesenchymal stem cells grown in a laboratory from normal volunteers. While carefully screened for diseases and genetic problems, these stem cells do carry the potential for possible rejection reactions. Finally, the last source and the one that seems to have the most promise- at least for now- are autologous stem cells. These are stem cells harvested from the iliac crest of the patient. Autologous stem cells provide an attractive option for osteoarthritis patients and their clinicians. However it must also be recognized that autologous therapies are expensive. Ideally, it would be good to treat the specimen obtained from the iliac crest to growth factors, cytokines, and chemokines, to stimulate an increase in the number of stem cells. However, both governmental regulations as well as sterility concerns preclude this step. In addition, the search for better matrix production to allow stem cells a "home" to grow in and multiply is still being studied. There have been a few clinical trials that have demonstrated some promise. The first comes from Murdoch University in Australia. Working with Australia's adult stem cell company, Mesoblast Limited (ASX:MSB), the University's pre-clinical trials of Mesoblast's patented adult stem cells had shown the therapy to significantly protect cartilage against damage in knee osteoarthritis. The project's principal investigator, Professor Rick Read stated, "We are delighted with the significant cartilage protective effects of Mesoblast's allogeneic (donor unrelated) cells in our large animal model of knee osteoarthritis, without any adverse events of the cells at all." Mesoblast's cartilage trials evaluated the effectiveness and safety of the company's allogeneic adult stem cells to treat osteoarthritis of the knee in 48 arthritic sheep joints. The results showed that osteoarthritic sheep knee joints receiving Mesoblast's stem cells had significantly greater thickness of joint cartilage, reduced cartilage breakdown, and greater biomechanical strength three months later than did control joints receiving hyaluronic acid. In another study, Duke University Medical Center researchers have "reprogrammed" adult stem cells taken from a small deposit of fat behind the kneecap into functioning cartilage, bone, or fat cells that could potentially be grown into replacement tissues for osteoarthritis. The research team has provided evidence that stem cells taken from different adult sources have the potential to be transformed into multiple specialized cell types. In the current study, the researchers took the fat pads from patients whose knee joints were removed during total joint replacement surgery. The fat pad is a dense structure behind the patella, or kneecap that is unlike typical fat tissue found throughout the body. They were able to isolate and grow adult stem cells from this tissue. According to scientists at Cardiff University, stem cells identified in their studies can be turned into cartilage cells (chondrocytes) in huge quantities. This may mean that limitations in cartilage transplants, in which healthy cartilage cells are collected and transplanted into a damaged joint, could be overcome. However, despite recent media reports that heralded the identification of these stem cells as a breakthrough in the treatment of osteoarthritis, this research is currently only being considered to treat people with limited cartilage damage only. Dr. Nathan Wei states, "Our current understanding of stem cell biology is obviously not where it needs to be. However, early work at our center using autologous stem cells obtained from iliac crest bone marrow and then concentrated has shown very promising results in patients with osteoarthritis of the knee. It is important to comment on the fact that prior to introduction of the stem cells, irritation of the cartilage and adjacent capsule is important to initiate an inflammatory response which then leads to cell proliferation which is an essential part of healing and subsequent cartilage regeneration." Dr. Wei adds, "For sure, though, I feel that this approach which is relatively painless will prove to be more effective than other therapies we currently have for osteoarthritis."